Hello! This is my first blog post so I thought I would write about my trip to the most magical place on earth.. Disneyland Paris! My Fiancé booked us a long weekend trip to Disneyland for my birthday in March and little did I know that he was planing to propose to me at Disneyland: but I’ll get to that later! When we arrived we took the Disney shuttle straight from the airport to our hotel. We decided to opt for a non Disney hotel, but still somewhere close to Disney. We stayed at the Relais spa val D’europe and I can not fault this hotel. We stayed there once before so we knew it was a good hotel as its close to everything. 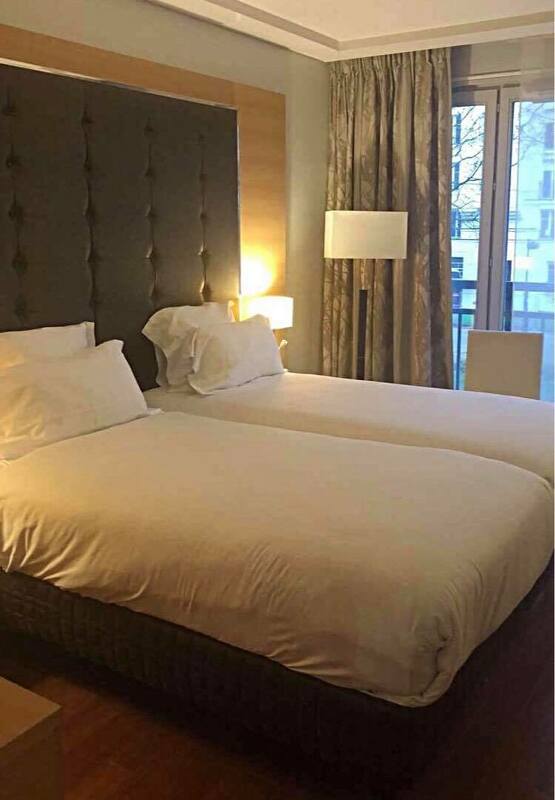 Its a few steps away from the train station that takes you to all the attractions in Paris including the Eiffel Tower and it’s not far away from val D’europe shopping mall and La vallee village. It’s also a few minutes away from Disneyland so it was perfect for us. They offer a little shuttle bus which takes you from the hotel straight to Disney anytime you want so there was no waiting around for crowded shuttle busses. If you’re looking for a cheaper alternative to a Disney hotel then I definitely recommend Relais spa val D’europe as the location can not be beaten. After looking around I quickly put my Mickey Mouse top on ready for a night at Disney village. When we got to Disney village we decided to go to Annettes diner. The food there is amazing! If you go to Disneyland Paris I definitely recommend going to Annettes. Although its always busy with queue’s out of the door so I’d recommend booking a table before you get there! 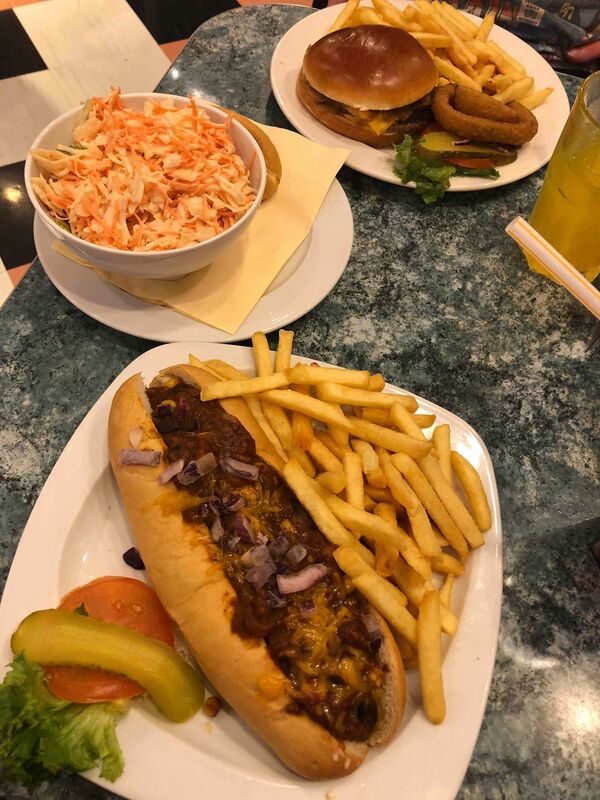 I got a chilli hot dog with fries and Nathan got a burger and fries. Both were amazing. On our second day we decided to go and see the Eiffel Tower. This was our first time seeing the Eiffel Tower as we never went there the first time we came to Paris. We got the train from Val D’Europe. The trains are so different there compared to the UK! The trains in Paris had three floors. When we arrived we headed straight to the Eiffel Tower and it wasn’t hard to spot! It was so surreal getting to see it in real life with my own eyes. I’ll always remember it. After taking about 14563564 photos, we went for a walk along the seine river. It looked beautiful however I bet it looks 10x more beautiful when the sun is out. It was quite cloudy and dull when we went but that didn’t ruin it, it still looked amazing. After getting lost in the beautiful streets of Paris, we decided to head back to our hotel. We decided to spend our night at the hotel’s spa pool and then decided to get a pizza takeaway and eat it in our hotel room. Perfect! Disneyland day! and my birthday! On our third day we went to Disneyland Paris to spend my birthday in Disneyland. We got up early, got ready and got the shuttle to Disneyland. It was such a nice feeling getting to see the castle again! Of course I had to take a million photos of the castle cause did you even go to Disneyland if you didn’t take a million photos of the castle? We spent our day seeing all of the Disney attractions and Disney characters and looking around until the Disney parade started. This was our first time seeing the Disney parade and it was so good! There was so many Disney characters. After watching the amazing Disney parade we walked around the Disney park, had something to eat and just had fun! We decided to stay until Disney illuminations because thats my favourite part! I LOVE it. It got dark and all the pretty lights around the castle were on and it looked so pretty. Me and Nathan were standing on the bridge in front of the castle waiting for Disney illuminations and Nathan got down on one knee and proposed to me in front of the castle! It was such a perfect time.. at Disneyland, in front of the castle, on my birthday. I couldn’t think of a better way to be proposed to. It was such a perfect end to my birthday and a lovely trip to Disneyland which I will always remember.